This hotel is 100pct non-smoking. New York Hilton Midtown located in the heart of midtown Manhattan on Avenue of the Americas between West 53rd and West 54th streets is within a short walking distance of Central Park Rockefeller Center Radio City Music Hall the Museum of Modern Art and Carnegie Hall and is just a few blocks away from Times Square Broadway theaters and the renowned Fifth Avenue shopping district. The 1 985-room New York Hilton is a sophisticated International hotel that appeals to both savvy business and leisure travelers. The hotel has recently been renovated with a contemporary look present throughout the lobby restaurant bars and lounges fitness center and spacious guest rooms and suites. Travelers select from a variety of modern spacious guest rooms and suites featuring Hilton*s Serenity comfortable bedding. Upgrade to the Executive Level or a suite and enjoy access to the Executive Lounge for complimentary breakfast and afternoon hors d*oeuvres. Grab a bite to eat at Herb N* Kitchen featuring seasonal salads artisanal sandwiches brick oven pizzas and specialty coffees. Stay cool in our Minus5 Ice Bar where you can touch feel and explore handcrafted ice sculptures and ice architecture made from Canadian ice. Enjoy your favorite cocktails in our Lobby Lounge or Bridges Bar. Stay active during your stay in the hotel*s 8 000 sq. ft. fitness center featuring modern strength cardio and entertainment equipment a Kinesis wall and resistance weights. 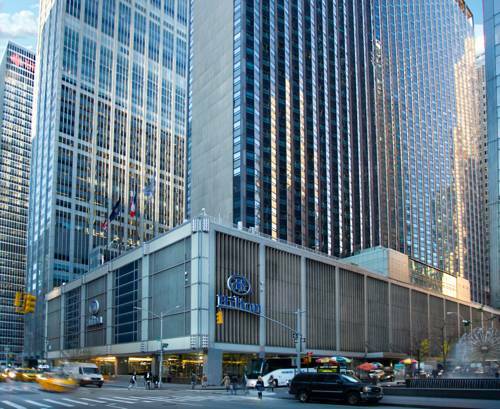 New York Hilton Midtown is much more than a place to stay in New York City. It*s a place to experience the city in ways that will inspire delight and even surprise you. CREDIT CARD GUARANTEE IS REQUIRED ON ALL RESERVATIONS REGARDLESS OF ARRIVAL TIME. INDIVIDUAL PLANS MAY VARY. SEE PLAN DISPLAY FOR MORE INFORMATION.